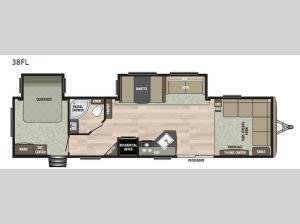 This spacious Keystone Springdale travel trailer 38FL offers many of the comforts of home featuring a front living area with an L-shaped sofa including a TV/entertainment center. This is the perfect space to hang out and enjoy a conversation or a movie with family and/or friends. There is plenty of seating space throughout the unit that both provides seating and can easily be made into more sleeping space if needed at night. The kitchen offers all that you need to prepare and cook for your hungry crew while camping. There is a large kitchen sink making cleaning up easy, a three burner range and an overhead microwave oven for cooking your meals, a 6 cu. ft. refrigerator, and two pantries for dry good storage. Mom and dad will love having their own space in the rear in the private bedroom.